Docent, LLC is dedicated to providing unique needs-based educational initiatives for practicing Dermatologists, Plastic Surgeons, Otolaryngologists and Ophthalmologists. Docent, LLC approaches continuing medical education with a fundamental belief that cross-disciplinary, hands-on, small group training is critical and important. 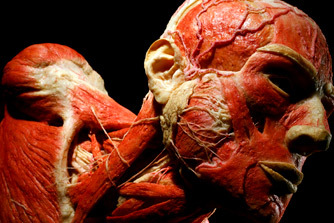 Human Cadaver Facial Dissection Workshop™ is a procedural anatomy course providing practicing physicians hands-on experience exploring the complex 3-dimensional anatomic structures of the face and neck. Utilizing small groups in a medical school laboratory, expert plastic surgeons will guide attendees through a dissection of the face and neck. Fresh-frozen heads will be used to specifically examine anatomic planes, fascia, muscles, arteries and veins. Participants will be taught how to identify craniofacial skeletal aging as well as the differential aging of fat compartments. Formal instruction will be offered in the in evolving methodology of injecting dermal fillers to recreate a youthful face with natural boundaries. Human Cadaver Facial Dissection Workshop™ will allow participants to see and understand the relationships among anatomic structures that are small, inaccessible, poorly taught and, as a result, frequently misunderstood. Armed with this practical knowledge, clinicians will be in a better position to avoid anatomic neurovascular danger zones during botulinum neuorotoxin and dermal filler injections. 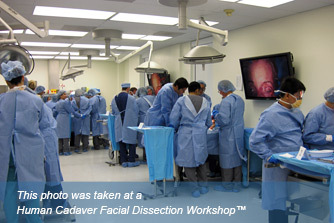 Human Cadaver Facial Dissection Workshops™ are currently being offered at aesthetic meetings across the country. For assistance with custom medical education; including anatomy workshops utilizing fresh cadavers, please contact Ana Morley.